The major salivary glands, particularly the parotid gland, are easily accessible for saliva sampling techniques. The use of these techniques, however, is limited by questions of interpretation and clinical value. § differentiation between normal and abnormal function of the glands. § information about gland dysfunction and its impact on the oral environment, including the mucosa and periodontal tissues. § clues to homeostatic fluctuations as a result of circulatory, innervatory, or hormonal adjustments. Secretion of saliva is an active and continuous process. Transport of electrolytes is enhanced by sympathetic and parasympathetic stimulation (1). Cholinergic activity is followed by water and electrolyte transport. After B-sympathetic stimulation, protein synthesis and exocytosis become predominant. A two-stage model for saliva production is widely accepted (2-4). First stage: in the acinus, a chloride shift is followed by sodium and water transport across the membranes and cell junctions. Within the cell, cyclic AMP is the second messenger accompanying protein synthesis and exocytosis following a- and 0-adrenergic agonists. Cholinergic water transport requires calcium. Simultaneously a 20-fold rise in capillary blood flow is observed. This 'primary secretion' is isotonic with plasma values. The main proteins are a-amylase and the proline-rich proteins. The total protein production remains, at about 1000 mg/l, far below plasma concentrations. In addition to active water transport the contraction of myoepithelial cells is an important flow-driving force. Second stage: the primary fluid is rendered hypo tonic in the ductules by active sodium and bicarbonate reabsorption. Some water is presumed to follow. In exchange, potassium and some proteins are secreted. This process is assisted by membrane K-Na-ATPase. It is interesting to note that reabsorption processes take time and reach steady-state values at a given flow rate. Within normal functional limits, salivary flow rate and sodium concentration show a good proportional relationship. At high flow rates, the primary secretion will pass through the pars striata too quickly to allow much reabsorption to occur, and hence the sodium concentration will also be high. In 'resting saliva' the sodium concentration falls to 1-2 mmol/l. Normally, the lining of the main excretory ducts is highly impermeable to water and maintains a low osmolarity of the ductal fluid. Particularly in cases of inflammation does equilibration of ductal with interstitial fluids result in elevated sodium values in saliva. It is obvious from the successive steps in secretion and reabsorption that contradictory results can be obtained for sodium levels. This makes correct interpretation rather difficult. They should therefore be interpreted with some caution. Whole or mixed saliva is unsuitable for estimating glandular function. Therefore, the application of suction cups mounted simultaneously on both parotid ducts is advisable (Figs. 1-3). Alternatively, a polyethylene catheter (0.5-1.5 mm) can be introduced through the duct orifice (5). A simple gustatory stimulus is provided by a 5 percent citric acid solution applied to the tongue surface by means of a gauze pellet every 30 seconds. Depending on the study design, the initially collected saliva (at 10 minutes) should be discarded. Salivary studies are best done at fixed hours in order to avoid circadian dissimilarities. The study of resting saliva is useful in neurological disorders like athetosis with drooling and Parkinson's disease. Measurements are always performed on both sides simultaneously. Small differences may be observed due to unequal flow resistance as a result of small variations in positioning of the collecting cups. In the correct position, a catheter of 1 mm. diameter produces a counter pressure equal to 2 cm water. Since a counter pressure equal to a 10 cm water column results in a 20 percent increase in salivary output, chewing forces causing compression of the duct should be avoided. Routine inspection of the parotid duct by gently pressing the gland is of no value except in cases of gross ductectasis where a sudden spurt of saliva will be seen. In contrast a sudden flow of saliva during massage is normal in the submandibular gland. Absence of this phenomenon, for instance in the presence of a calculus must be considered as a sign of abnormality. fig. 1 Suction cup. The inner chamber is placed over the duct orifice. Measurements: outside diameter 16 mm, outer ring 1,5 mm, height 4,5-6 mm. fig. 2 Application and simultaneous collection on both sides is required. fig. 3 Suction equipment. The negative pressure to the outer chamber of the cup is approximately 200 millibar. Salivary flow rate is given as ml/min/gland. We consider the 'net' flow to be the resultant salivary volume secreted by an activated section of the gland minus the reabsorbed portion. Under 'resting' conditions the flow rate of the parotid gland amounts to 0-0. 1 ml/min. After citric acid stimulation the range is 0.5-1.5, ml/min. The functional reserve in top secretors can reach up to ml/min. Stimulated values below 0.3 ml/min are considered pathological. Elevated flow rates will be seen under conditions such as gingivitis. recent prosthesis and dominant cholinergic activity in Parkinson's disease, intoxication etc. Low values are found during the use of, e.g., (tricyclic) antidepressants after duct disintegration caused by inflammation or irradiation and after radical surgical treatment. The effects are more dramatic in resting saliva on account of intensified water reabsorption in the resting state. In some cases a functional reserve will mask this effect. fig. 4 Latency time related to flow rate in the parotid gland. Below approximately 0.3 ml/min. the latency time increases rapidly and is always more than one minute. If the initial fluid is not discarded, a latency time elapses between the application of a stimulus and the appearance of saliva in the collecting catheter. A period of about 20 seconds is found in normal glands. Both flow rate and latency time are related to each other (Fig. 4). There is a sharp rise of the latency time below, flow rates of 0.3 ml/min. Values exceeding 60 seconds are therefore considered pathological. A long latency time points to all kinds of diminished glandular function including the existence of a very small gland. It is also a prominent feature of the dead space in ductectasis and has been described as the 'fire-hose' phenomenon. A large number of clinical observations in our own department indicate a close relationship between long latency times and the sensation of xerostomia. After irradiation, latent periods exceeding 10 minutes are seen. As is the case with other organs, it is difficult to estimate the exact glandular volume. What matters, however, in clinical situations is the functional capacity. This is illustrated by obvious changes in aging glandular parenchyma. In spite of the loss of about 30 percent of secretory tissue, there is little or no decrease in stimulated flow rate (6). By elevating the catheter system above a height of 10 cm. the salivary flow slows and eventually ceases at 50-60 cm above the ductal orifice. By interposing a water column of up to 10 cm within the collecting system the flow rate increases unilaterally. As already pointed out, this initial increase may well be compared with the effect of duct compression exerted by masticatory muscles (5). Meanwhile a transepithelial reflux can be demonstrated while duct permeability increases. As the salivary drive is predominantly generated by myoepithelial cell contraction, it is of interest to note a similarity in peaking values of salivary pressure during maximal secretion as well as in cases of abnormal sodium retention, as shown in Fig. 5. In both groups. This may be attributed to the simultaneous participation of an increasing number of acini with their corresponding myoepithelial cells. fig. 5 Salivary pressure related to sodium concentration in the parotid gland. High pressures are reached in the top secreting as well as in the sodium retention group. The choice of laboratory investigations should be based on presumed relationships with intra glandular transport processes (sodium), intra cellular synthesis (protein, amylase), and diffusion by plasma constituents (urea). Saliva also influences the oral environment in a number of ways (glycoproteins). Measurements are given as concentrations, c.q. mmol/1. This facilitates the assessment of ion/water shift and osmotic values. Secreted solutes, given as mmol/min or in mg/min (mmol/1 x ml/min), are useful in judging acinar destruction, as in irradiation and aging. Routine laboratory investigations include potassium calcium, sodium, chloride, bicarbonate, urea, total protein, amylase, and osmolarity measurements. fig.6 Sodium concentration related to flow rate. It shows a good proportionality from 0.1 to 2.5 ml/min. A number of membrane processes facilitate sodium and water transport from the interstitial tissues into the acinar lumen. After both cholinergic and sympathetic stimulation, plasma values are found in the primary fluid for sodium, chloride, and bicarbonate. Potassium is slightly elevated. The primary secretion is almost isotonic with plasma (2). Therefore the variable sodium concentrations at different flow rates depend on changes during duct passage. Within the ductules, the pars striata is responsible for sodium chloride and bicarbonate reabsorption. As this transepithelial transport is time consuming, values are flow-dependent (Figs. 6 and 7). Sodium concentration is proportional to flow rates from 0. 1 to 2.5 ml/min. Here the formula, f(x) = 36(x) is applicable. During further duct passage, some water equilibration takes place and will account for slightly elevated sodium concentrations at extremely low flow rates. If, on the other hand, the parotid gland is stimulated maximally, with flow rates over 2.5 ml/min., the sodium level tends to 'plateau'. This stabilization of sodium concentrations at a fixed level is a challenging phenomenon. It may be interpreted as an effect of enlarging the acinar secreting surface by simultaneously activating more acini. In this situation, there is no further increase in primary secretion per acinar unit. Therefore the sodium gradient across the striated duct lining is stabilized. The sodium concentration in the main duct tends to be unchanged as well. Meanwhile the flow, i.e. the final salivary output, will be increased due to the participation of a larger number of acini on account of a functional reserve within the gland. Sodium plateau forming is observed in the smaller parotid glands as well as in cases of diminished capillary blood flow. Thus, very low plateau values, ranging from 1 to 2 mmol/l. are often seen in patients with serious circulatory problems. Sodium re-absorption will be accompanied by water reabsorption. There is, however, no information about the amount of water reabsorption in relation to the initially formed fluid. If increasing sodium reabsorption is accompanied by equivalent water reabsorption, a steady state with zero saliva efflux during the night might be postulated. When measuring salivary constituents, the effect of water reabsorption on the concentration of the larger molecules must be taken into account. Some increase of the larger molecules can be expected as a result of this water shift. Damage of any kind to the striated duct will lead to decreased sodium (and water) reabsorption. In contrast to this, leakage from the 'passive' main duct results in water loss due to osmosis. We assume this continuous osmotic drive to be responsible for the ecstasy of the main duct regularly seen in chronic inflammation. Bicarbonate is part of an important buffer system in the oral cavity (2. 7). Reabsorption mainly takes place during passage through the intra lobular duct. Usually, low concentrations of bicarbonate appear together with low sodium. However, low values are also found coupled to small secretion rates, even where sodium concentration is high, as in cases of inflammation or irradiation. Except for extreme situations no correlation was found with the body acid-base balance. After bacterial breakdown the urea components provide another buffer system in the oral cavity. A number of characteristics of urea make this substance a useful tool in sialochemistry, notably its central production in the liver, low molecular weight, and electric neutrality. These properties allow a quantitative assessment of the reabsorption of water within the gland. Acinar values of urea are slightly below plasma levels, probably because of some flow-dependent molecular reflection (8). Laboratory- findings will show a steady, state of urea concentration in saliva at 30 percent below the plasma value, when salivary flow rates exceed 1 ml/min/gland. The mean salivary urea approaches plasma urea values at flow rates of about 0.3 ml/min. It surpasses plasma values at flow rates beneath 0.3 ml/min (Fig. 8). This isoconcentration point is modified by the sodium reabsorption activity. This fairly, reliable flow-dependent urea gradient will gradually disappear in situations of increased duct-wall permeability due to inflammation, irradiation etcetera. fig.8 Salivary urea and corresponding serum values related to flow rate in different patients. Equilibration point at about 0.3 ml/min. The salivary potassium concentration shows a more or less constant level of 20-25 mmol/l. Incidental high values of up to 60 mmol/l are found, resembling the results of 'stop flow' experiments. Elevated concentrations will be observed in the first portion of saliva sampled after applying a stimulus (Fig. 9). These 'rest transients' disappear in a collected volume of more than 3 ml. Since active potassium secretion takes place mainly in the striated duct. Low values (< 10 mmol/1) are seen after the destruction of this ductal segment. The active potassium secretion may allow differentiation between destruction by inflammation and irradiation. The striated duct appears more radio-resistant than acinar tissue. fig. 9 Potassium transients from the resting steady state are washed out by the first3 ml. after stimulation. The salivary glands play an active role in the synthesis of numerous proteins. Abnormal proteins are also produced under exceptional conditions, such as the development of tumours and nutritional deficiency. The exocrine secretion is dominated by a-amylase. Other constituents are the (acid and base) proline-rich proteins, the immunoproteins, and the growth factors. The two latter, as in the case of the glycoproteins, are mainly produced in the ductules. Other substances, for example some blood proteins and steroids, enter the duct via a transepithelial route. The mucins (glycoproteins), which play an important role in oral functions, originate mainly from the sublingual and the numerous smaller glands. Major health problems will arise in inherited mucin disturbances. These are known to occur in cases of cystic fibrosis. The condensed protein chains are stored in secretion granules with special membrane characteristics. Undissolved inclusions will appear as 'spherulae' in saliva (2. 9. 10). These spherulae may be responsible for the milky appearance seen at times in resting saliva and in cases of increased sodium (and water) reabsorption. The specialized acinar functions of producing, storing, and discharging secretory protein are mainly under the influence of the sympathetic nervous system. Any such autonomic nervous system disturbance will easily lead to derangement, frequently dominated by abnormal storage and acinar swelling. 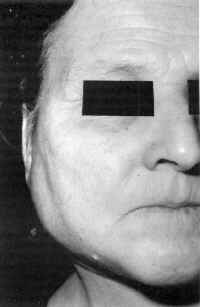 The clinical effect is bilateral swelling of the whole gland in the parotid and submandibular regions. Low a-amylase concentrations are seen in cases of starvation and after acinar destruction and degeneration of the acinar cells. Elevated a-amylase and total protein is to be expected in abnormal ductal water loss. Furthermore, acute inflammation of the glands produces a rise in plasma and urine amylase due to gross glandular leakage. This will be seen in mumps as well as in the presence of a salivary calculus. The various functions of the salivary glands depend in every respect on the body's main regulatory systems. The glands have high-energy demands while they require flexible perfusion facilities. However, the body gives low priority to the production of saliva compared to the maintenance of vital organs such as the brain, kidney, or heart. In general, changes in capacity or dynamics of the circulation are directly reflected in salivary gland function by a diminished flow output and abnormal sodium retention. Therefore blood investigations will be directed to a number of body- functions and pathologic changes related to regulatory patterns. The important ones are the blood count and the chemistry related to circulatory disorders, diabetes, thyroid function, metabolic liver function, auto immune disorders, and the consequences of the use of drugs. Repeated recording of the blood pressure should not be neglected. Sialochernistry does not accommodate classical nosology. Different diseases that have inflammatory processes in common will show the same changes in their sialochemical patterns. These patterns are very sensitive. At the same time, the specificity regarding classified diseases is low. Therefore a correct diagnosis will always require a full clinical and laboratory investigation. However. sialochemistry is a useful means of chronologically, monitoring quantitative changes. Inflammation in the salivary glands is characterized by accumulation of B-lymphocytes around the ducts and acinar cells, causing destruction and/or proliferation (11). Atrophy of the acini may follow ductular obstruction. Consequently, there is decreased sodium reabsorption and potassium secretion in the striated duct, while water is drawn through the disintegrating duct lining by osmosis. Initially, total protein and amylase rise while the output in mg/min decreases. In chronic inflammation, the latency time may be prolonged while the flow is elevated. In this situation, the latency is largely due to ductectasis. It is assumed that a compensating mechanism that simultaneously stimulates more acini is responsible for the elevated output. The continuous osmotic drive across the duct lining is assumed to be the cause of the ductectasis itself. The latter is a prominent feature of chronic inflammation, as demonstrated by sialography. Mumps, or epidemic parotitis is the most common of all salivary gland diseases (5. 10). In about 50 percent of cases, clinical changes in the glands are absent. Where swelling is prominent, oedema and a massive accumulation of lymphocytes and plasma cells compress the salivary duct, which may result in almost complete asialism. The diagnosis is made by detection of a rise in antibody titer by complement fixation after two estimations. Elevated values for serum and urine amylase are consistently found. Differentiation of the isoamylases distinguishes between a rise due to parotid as opposed to pancreatic pathology. In mumps the saliva shows a sharp increase in the sodium concentration and an exceptionally low potassium concentration, which approaches its plasma equivalents. Sodium values rise to 90-120 mmol/I while potassium values fall below 10 mmol/l. Aberrant values may persist for months. In children, repeated attacks of parotitis may affect one or both sides. They generally follow a common cold and last a period of three to five days. Histological, ductal damage by lymphatic invasion is observed (12). This results in the extravasation of a contrast medium giving rise to the 'snowstorm appearance' of pseudectasis. As lymphatic tissue gradually disappears by puberty, attacks will fade away in most patients. During the acute phase, flow rates of saliva are reduced and areas of purulent necrotic discharge are found from which physiologic oral flora can be cultivated. Sialochemistry demonstrates all the signs of inflammation. During remissions, the sialometric parameters will also recover. This behavior differs from that seen in Sjögren's syndrome and after irradiation. At the moment, little is known about the immunohistology of and the immunoproteins in saliva. Further investigations should be conducted in this most interesting field. The flow rate is often somewhat elevated in the latent periods of the disease, indicating a small residual obstruction. This clinical entity, that includes kerato-conjunctivitis sicca, xerostomia and rheumatoid arthritis, probably depends on the presence of activated T-lymphocytes and hyper reactive B-lymphocytes in exocrine organs (10, 13). The auto immune behaviour of these lymphocytes expresses itself by producing a large number of non-specific antibodies, which can be demonstrated by laboratory investigation. The parenchyma of all the salivary glands reveals destruction of the ductules, creating myoepithelial islands (14). The acini are gradually lost. There is swelling of the major glands, at times with redness and pain. In cases of purulent flow. Streptococcus viridans, Klebsiella or Enterobacteriaccae can be cultured. While the 'primary' Sjögren type is seen in all the salivary glands, a gland biopsy, from the lower lip confirms the diagnosis if accumulation of IgM and IgG is demonstrated (15-17). Sialochemistry. The multiple foci of gland destruction and the degeneration of acinar cells is rapidly followed by prolonged latency times and decreased flow. This is more pronounced in resting secretion, while stimulated flow rates initially appear to be normal (Fig. 10). High sodium concentrations ranging from 60 to 100 mmol/1 are found at any given flow rate (Fig. 11). The potassium concentration lies between 10 and 20mmol/1. The total protein production in mg/min is lower during the disease while concentrations of protein persist at an elevated level. This behavior parallels that of amylase. fig. 10 Scatter diagram of stimulated flow rates in Sjögren's syndrome at different ages. fig. 11 Sodium concentration and flow rate rate in Sjögren's syndrome compared to the standard curve. Aberrant electrophoretic patterns may be seen. The typical inverse of the saliva/scrum urea graph at about 0.3 ml/min flow rate is lost. This indicates leakage of both water and urea and might be responsible for the extremely low secretion rates at rest. This is also in accordance with ductectasis. The lymphocyte infiltration may be the cause of the ductal damage and pseudectasis seen in sialography. If a malignant lymphoma develops incidentally, abnormally high calcium concentrations are found even surpassing plasma values. Further laboratory investigations, including electrophoresis, immunochemistry, and blood counts, should always be performed. While erythrocyte sedimentation rates above 60 mm and globulins > 18 g11 alone are not pathognomonic, their appearance in combination with the described sialochemistry is highly suggestive of Sjögren's syndrome. Some studies emphasize the sharp rise in glandular kallikrein and its significance in maintaining inflammation. Improvement is seen after intravenous administration of its antagonist aprotinin (Trasylol) (18) with kallikrein concentrations in saliva normalize within 24 hours. As a part of systemic sarcoidosis. granulomatous foci may be seen in the salivary glands, which may even cause bilateral swelling of the parotid gland. This epithelioid sialadenitis does not lead to serious functional glandular disorders. The flow is elevated as a result of slight tissue compression. Sialochemistry fails to reveal inflammatory changes. Kallikrein is reported to be low (5). While angiotensin converting enzvme (ACE) will be elevated in the plasma, it is not known whether or not ACE is present in the saliva. Normally, this enzyme is absent in saliva. Radiotherapy of malignancies of the head and neck causes rapid and severe destruction of the parenchyma of the glands. A loss of function of up to 50 percent is measured within the first week ( 10). In the most susceptible serous glands, cell enlargement, formation of vacuoles with degranulation, and finally necrosis develop. Capillary walls are thickened and atrophy of the nerves follows after several months. Sialochemistry immediately reveals inflammatory changes (19). An increased latency time of 10 minutes or more is not exceptional. Flow falls to zero while the rise in sodium level is steep (80-120 mmol/1). Potassium values are stable, while amylase diminishes both in concentration and production (Fig. 12). These alterations indicate decisive acinar destruction and relative radio resistance in the ductal segments. Some repair is seen in most cases. However, there will never be a return to pre-therapy values. While the effects of radiotherapy are generally described as quantitative, the subjective sensations and experiences are not. Complaints of intense oral dryness and sticky saliva are the rule. A shift in oral flora towards the gram-negatives will also be responsible for superficial mucositis and distorted oral perception (20). fig. 12 Diagram of latency, amylase activity, sodium concentration and flow after radiotherapy. In the lower diagram sodium concentration on the left is plotted against flow rate on the right according to: sodium = 36 x flow rate. Normally both lines should coincide here. The normal proportional relationship between salivary flow and sodium concentration is absent in a number of persons. Not only are smaller flow rates measured but also the sodium concentration is relatively low and fluctuates around a steady state of 2.5 mmol/1 (Fig. 13) while most other substances are slightly raised. In some cases, the saliva has a milky appearance. These indications of sodium retention dysfunction syndrome are fairly typical and may be found at all ages, although they are more prevalent in later life. The entity is seldom described in the literature (21). Prominent clinical signs are the sensation of a dry mouth and incidental unilateral painless swelling of the parotid gland for a few hours e.g. during breakfast (Fig. 14). With some exceptions, the dysfunction persists through life. Impaired gland perfusion is frequently found. This may be caused by arterial wall thickening or by 'homeostatic' mechanisms of the circulatory system in favour of other important organs. Risk factors can be listed in subgroups such as both hyper- and hypo tension. cardiac failure, local and systemic oedema from other causes, and dehydration. A sudden onset of sodium retention is seen after arteriovenous shunt in hemodialysis. This phenomenon is not related to the time at which dialysis was actually performed (22. 23). Increased sodium reabsorption may be due to hormonal effects on the sodium/potassium exchange rate or even to elongation of the striated duct (22). Both mechanisms should be regarded as minor factors in man. One hypothesis is diminished perfusion of the gland followed by intensified release of neural impulses. This simultaneously activates more acini, thus enlarging the secreting surface. The adaptation partially restores the total fluid output, while the flow per ductule is not substantially changed. In this way, sodium reabsorption remains in a steady state despite the increasing flow rate. The functional shift described has its analogy in the plateau sodium values reached in the maximal stimulated normal parotid gland. In this situation, maximal output is also finally reached by simultaneously activating more acini. Further support for this hypothesis concerning sodium retention dysfunction is given by salivary pressure measurements. As can be seen in the graph of Fig. 5, the upper pressure levels are recorded at the high sodium concentrations as well as at the low values. They represent both the top secretors and the sodium retention dysfunction group, suggesting a similar increase in the number of participating acinar rnyoepithelial units. Under normal conditions, salivary glands never function as a whole. Their sequential lobular activity is clearly visualized during surgical procedures using a nerve stimulator. It is important to note that sodium retention dysfunction syndrome is seen not only in the parotid but also in the submandibular glands. Under these conditions the deregulated glands are 'at risk' of superimposed pathology. Whereas unilateral painless swelling for short periods is the usual symptom, in some patients the reverse is encountered, These patients complain of bilateral swelling with painful tension and only incidental hours or days of regression and a normally shaped face. It is suggested that they have very large parotid glands or else an intensified sodium reabsorption rate in the striated duct. Swelling may be due to accompanying water reabsorption. Particular in this group, a transitory swelling is seen after the use of lipiodol in sialography. Regression of the swelling is achieved by reducing the reabsorption time by administration of pilocarpine. Sometimes amelioration is seen during the use of spironolactone. The sialochemistry, of the latter group is characterized by increased or even normal flow rates and an equilibration point of serum/saliva urea at flow rates >0.3 ml/min. This shift strongly suggests increased water reabsorption. The extended latency time, the reduced flow with sodium retention, and low bicarbonate values accompanying the sodium retention dysfunction syndrome may have a profound impact on the oral environment. This kind of gland dysfunction is in fact a common finding in periodontal disease, superficial glossitis, glossodynia, and taste disorders. Evaluation of salivary gland function therefore is indicated in a broad range of clinical signs and symptoms. The term sialadenosis is applied to non-inflammatory- disorders of the parenchyma of the salivary glands. These disorders are rooted in metabolic and secretory unbalance and are frequently, accompanied by painless bilateral swelling of the major glands, especially of the parotid gland (25. 26). The swelling persists for years. The condition is seen in nutritional and metabolic defects (anorexia nervosa. alcohol abuse), endocrine disorders (diabetes), neurogenic disorders and unbalance after prolonged use of B-sympathomimetic drugs. Histology shows excretory disturbances with light or dark staining and swelling of the acinar cells. Hypertrophy or hyperplasia may also be found. A primary neuropathy is suggested (27). No characteristic pattern can be identified in sialochemistry. The swelling itself may cause a slightly elevated flow rate due to pressure effects. The failure of the exhausted acinar cells is reflected by a low amylase concentration and output parallel to the total protein curves. However, both inhibition and stimulation of acinar proteins seems possible. A painful unilateral swelling of the parotid gland is occasionally, reported in seriously ill patients. It is sometimes referred to as nosocomial parotitis because of its prevalence during hospitalisation. When purulent discharge appears from the duct orifice, the cultivated flora frequently, originate from the digestive tract. Circulatory failure and uremia with consequent xerostomia often dominate the clinical picture. If sialochemistry, is performed it will reveal a markedly reduced secretory flow with distinctly low sodium concentrations in the non-affected gland and very high concentrations on the diseased side. As in other ascending infections of the glands, the healthy gland provides insight into the pathogenesis of this condition. Until now, the contribution of sialometry and sialochemistry to the diagnosis and differentiation of salivary, gland tumours has been small. Early indications of any- disorder in gland metabolism or protein synthesis are neither to be found nor to be expected because of the isolated and nodular nature of most tumours. However abnormal function of secreting tissue may contribute to the production of tumour markers which will direct attention to special cells or sites in the secretory system (28). In this field immunohistology leads the way. In the future, cytodiagnosis of cells in salivary samples should be strongly encouraged. This will also prove helpful in differentiating between a neoplasm and inflammation. A striking feature, not easy to explain is the relatively extreme bilateral sodium retention in parotid saliva within the pleomorphic adenoma group (Fig. 15). fig. 15 Sodium concentration and flow in pleomorphic adenoma. The line represents the standard curve. A detailed description of the numerous drugs that influence glandular function is beyond the scope of this section. However, some general remarks should be made. Most anticholinergics, including the majority of antihistaminics, tricyclic antidepressants, and anti -Parkinson's drugs, suppress the pulse frequency of the salivatory nucleus. Apart from age-dependent changes during prolonged drug administration, these effects are reversible. In sialochemistry, the stimulated saliva values in this group come very close to those of the resting saliva. There is a small risk of obstructive oedematous swelling of the parotid gland on waking up, probably due to adhesion of the duct orifice lining. Accelerated flows are seen after administration of cholinergics, with sodium and bicarbonate concentrations corresponding to the flow rates. The output and concentration of total protein amylase and calcium are increased while potassium is diminished. Apart from ample experimental research in sialadenosis, the clinical effects of sympathicomimetics have not been fully evaluated. Beta-mimetics facilitate the expulsion of salivary proteins by increased myoepithelial contraction and also enlarge a pre-existing ectasia. In sodium retention dysfunction syndrome, no immediate improvement is seen after drug-induced dilatation of the peripheral vessels. Nevertheless, normalized function is sometimes observed after administration of diuretics. The immunosuppressive myelo-suppressive and cytotoxic effects of chemotherapeutic agents profoundly influence salivary gland function (29). Reduced flow and inflammatory changes dominate in sialochemistry. Obstructive and painful swelling is infrequent but predicts a terminal course in these cases. Sialometry and sialochemistry should be regarded as valuable diagnostic tools that may well prove useful in comparing gland function on the two sides. They are also reliable in intra-individual follow-up studies. Despite the lack of standard mean values and the absence of interdependent parameters (30) it is possible to make a dependable assessment of gland function related to the systemic background and of the risk factors in oral balance. The main drawback of these techniques is their lower specificity for the classical entities in clinical pathology. Unfortunately, communication and cooperation between research groups and clinical workers is inadequate. Cooperation must be promoted. Also consensus-building should be fostered with regard to a protocol for investigations. Sreebny L.M. ed. The salivary system. Boca Raton: CRC Press. 1987: 69-93. 2. Young JA. Cook DE, Lennep FW van, Roberts M, Secretion by the major salivary glands. ed. The salivary system. Boca Raton: CRC Press, 1987: 95-116. Raton: C.R.C. Press, 1987: 123-131. 5. Mason DK, Chisholm DM. Salivary glands in health and disease. London: Saunders, 1987: 249. 6. Scott J. Structural age changes in salivary glands, In: Ferguson DB, ed. The aging mouth. Basel: Karger. 1987: 40-61. 8. Leaf A. Transport of urea across a living membrane. In: Schmidt-Nielsen B. ed. Urea and the Kidney. Amsterdam: Exe Med Found, 1970: 83-88. 9. Tandler B. Riva A. Salivary glands. In: Mjör IA, Feyerskov O, eds. Human oral embryology and histology. Copenhagen: Munksgaard, 1986: 243-284. 10. Harrison JD et al. Ultra structural morphology of secretory granules of submandibular and parotid salivary glands of man. Arch Oral Biol 1987: 32: 229. 11. Seifert J et al. Speicheldrüsenkrankheiten. Stuttgart: Thieme. 1984. 13. Talal L. Overview of Sjögren's syndrome. J Dent Res . 1987; 66: 672-674. 14. Saku T, Okabe H, Immunohistochernical and ultra structural demonstration of keratin in epi-myoepithelial islands of auto immune sialadenitis in man. Arch Oral Biol 1984; 29: 687 689. 15. Scully C, Sjogren's syndrome. Clinical and laboratory features, immunopathogenesis and management. Oral Surg Oral Med Oral Pathol 1986; 62: 510-523. 16. Stuchell RN, Mandel ID, Baurmash H. Clinical utilization of sialochemistry in Sjögren's syndrome. J Oral Pathol 1984; 13: 303-309. 17. Hené RJ, Wilde PCM de, Kater L. De betekenis van cle sublabiale speekselklierbiopsie als diagnose bij het syndroom van Sjögren, de ziekte van Besnier Boeck en amyloidosis. Ned Tijdschr Geneeskd 1982; 126: 1027-1033. 18. Deeg M. Maier H, Adler D. Zur Therapie der chronisch- rezidivierenden Parotitis. In: Weidauer H. Maier H. eds. Speicheldrüsenerkrankungen. Berlin: Springer, 1988: 29-35. 19. Marks JE et al. The effects of radiation on parotid salivary function. Int J Radiat Biol 1981; 7: 1013-1019. 21. Rauch S. Natriumretinierende Sialose. Arch Klin Exp Ohren Nasen Kehlkopfheilkd 1967: 188: 525-528. 22. Lichte JR, Mulder AW, Michels LFE. Parotid gland dysfunction in haemodialysis patients. Neth J Med 1983~ 26: 39-43. 23. Shannon I, Feller RP, Eknoyan G, Suddick RP. Human parotid saliva urea in renal failure and during dialysis. Arch Oral Biol 1977; 22: 83-86. 24. Junqueira LCU. Control of cell secretion. In: Schneyer LH, Charl A, eds. Secretory mechanisms of salivary glands. New York: Academic Press. 1967: 286-302. 25. Rauch S. Die Speicheldrüsen des Menschen. Stuttgart: Thieme. 1959. 26. Chilla R, Sialadenosis of the salivary glands of the head. In: Pfaltz CR. ed. Sialadenosis and sialadenitis. Basel: Karger. 1981: 1-38. 27. Donath K. Die Sialadenose der Parotis. Stuttgart: Fischer. 1976. 28. Otto HF et al. Immunohistologische Charakterisierung maligner Speicheldrüsentumoren. In: Weidauer H, Maier H, eds. Speicheldrusentumoren. Berlin: Springer, 1988: 53-67. 30. Blomfield J et al. Interrelationships between flow rate. amylase, calcium, sodium, potassium and inorganic phosphate in stimulated human parotid saliva. Arch Oral Biol 1976; 21: 645650.